Today’s story from 1 Kings is a vivid encounter between the prophet Elijah and God. It is a great introduction to our theme for Lent, “LISTEN!” Over the next seven Sundays, we will be exploring ways we can listen to God. You may have noticed that the sanctuary is a little different, as is the bulletin. All around the sanctuary, there are listening stations. Each of them is set up in a way for you to find ways to interact with and listen to God. The prophet Elijah didn’t have the luxury of this setup. He had a few moments of 1 on 1 communication with God, which helped him then speak God’s wisdom to the people of Israel. In today’s passage, however, we find the prophet of God hiding in a cave, in fear for his life. What led up to this moment? Prior to the passage, we learn that there was a holy war going on. The king of Israel, Ahab and his wife, Jezebel were followers of the Baal religion. Baal was a Canaanite weather god who was quite popular throughout the holy land at the time. Throughout the Hebrew Scriptures, there is mention of the cult of Baal, and that the Hebrews went back and forth between worshiping God and worshiping Baal. Back at least as far as when the Ten Commandments were given, there were likely worshipers of Baal present, as Aaron made a golden calf to take the place of God- which is one of the images that often represented Baal. During this time of religious upheaval, there was a severe drought, which according to 1 Kings 17 was brought on by the prophet Elijah as a punishment to King Ahab for not following God and instead worshiping Baal. We get a snippet in today’s passage that Ahab’s wife Jezebel has killed off a number of the prophets of God. Some are hiding in safety in a cave. The Prophet Elijah risks his life, confronts King Ahab, and calls for a showdown between himself and the prophets of Baal. Whosever god was stronger in demonstrating their power would win the hearts of the people of Israel. Elijah wins the test, as God shows up in a mighty way, while Baal is a no show. Elijah then has the prophets of Baal all killed, helping Israel to swear allegiance to God and turn from Baal. This brings us finally to chapter 19. As a result, Ahab’s wife, Jezebel, a devoted follower of Baal writes a letter to Elijah-swearing to kill him within the next 24 hours. The plot thickens! Elijah, in no mood to test the Queen’s power, flees, first to the south in Beersheba, then further into the desert. He falls under a bush, collapses in its shade, and then prays for God to take his life. He says, “I have had enough, God. Take my life, for I am no better than my ancestors”. An angel intervenes and provides food and water- in fact, a double portion. The Angel tells him he has a long journey ahead, and after some rest, it is time to get moving. A powerful wind, perhaps a hurricane tears apart mountain and rock-But God was not in the wind. A powerful earthquake shakes the ground- But God was not in the earthquake. A fire sweeps across the land-But God was not in the fire. These 3 elements are from Exodus 19 when commandments were given to Moses. In that scene, God was in each of those elements, but not here. God spoke in a loud voice in that moment. Here, God speaks in a still, small voice, like a gentle whisper. Elijah felt the presence of God in that still, small voice and pulled his cloak over his face. THEN he went out to the mouth of the cave. God asks him the same question as before. “Elijah, what are you doing here?” Elijah provides basically the same answer as before. What follows next are instructions in the small, still voice of God for Elijah- anoint 2 people as Kings, and anoint your successor, Elisha, who will be the next prophet of God. Elijah listened and followed God’s instruction. Eventually, perhaps as a reward for his faithfulness and being attentive to God speaking with him, Elijah is taken up to heaven in a fiery chariot- the only prophet not to die an earthly death, but instead who ascended into heaven. This passage is all about God speaking, and Elijah listening. 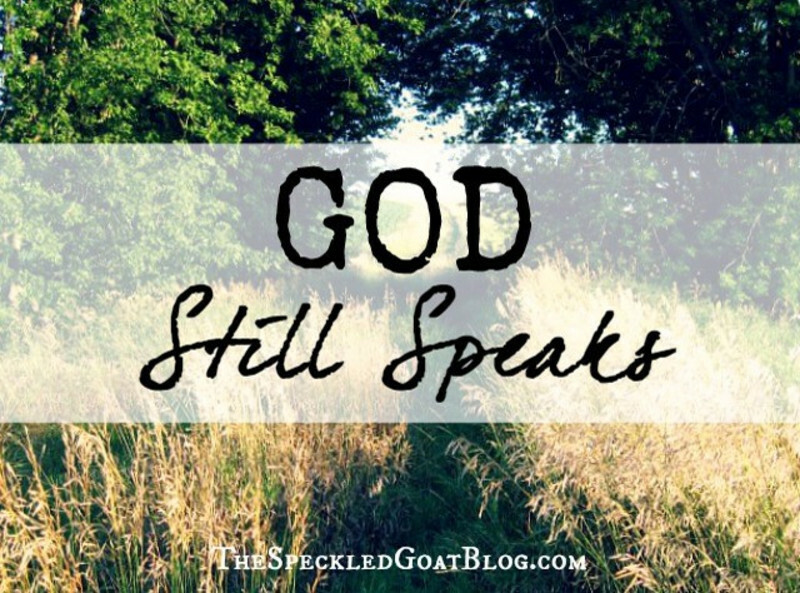 That brings us to the question, Does God speak today, and if so, how? According to the "The Washington Times", from a story published February 13, 2018, last year, Vice President Mike Pence’s Christian faith was mocked on ABC’s “The View” as the co-hosts mulled over hearing how he speaks and listens to Jesus on a regular basis. Omarosa Manigault-Newman, President Trump’s disgruntled ex-staffer, used her status as a “Celebrity Big Brother” contestant to insinuate that the vice president suffers from mental illness. The claim — “he thinks Jesus tells him to say things … Scary” — served as fodder for ABC’s Joy Behar. “It’s one thing to talk to Jesus. It’s another thing when Jesus talks to you. That’s called mental illness if I’m not correct. Hearing voices,” she said. Are we mentally ill for thinking we can hear the voice of God speaking to us? No. It isn’t mentally ill for a person of faith to believe that the Creator of all things cares for, tends and reaches out to those who are created in God’s image. Faith, belief in something other than ourselves means we can in faith believe in a God who still speaks today- through scripture, through prayer, through authors who write about faith, through preachers, teachers, art and music, and other forms as well. I will share with you a few experiences of God speaking to me. First, at the age of 5, I remember sitting in a small chapel while my mother was praying. I saw light streaming through a stained glass window and felt a presence-God proclaiming “I am here” to me in a still, small voice. Then as a teenager, while on a youth group weekend trip to a beach, I heard God speak quite clearly. This was a really messed up youth group trip, unfortunately. A number of older kids who had friends in the group crashed the weekend, brought drugs and partied down on the beach the first night we were there. I got sucked into it all, drinking and smoking pot with these older guys. Then, one of the guys keeled over and began to have a seizure. We needed an ambulance. I shook myself from my stupor and began running back to the beach cabin where our youth pastor was with some of the other kids. As I was running up the hill to get someone to call for an ambulance, I heard a voice, quite clearly in my head say, “Keep this up and it will be you lying on the beach.” That was NOT a still, small voice. Another time I heard God, but not with words. It was after the death of our first child. Months after she died, I was sitting out in the sun on a bench, just being quiet, pondering our life and our loss. After a few minutes, I took out a notebook and began to draw, nothing specific in mind. In time on the page was an image of a baby in a blue blanket in the hands of God, with Paula and I standing beside, along with the image of a young girl, who I thought was our first daughter, now free from her earthly struggles. This was long before we ever thought of trying to have another baby. I wasn’t sure what the message was, but I remember showing it to my wife and wondering. 4 Years later that vision became reality. The image turned out to be our son Sam, who we adopted on the day he was born. 6 years later, we adopted Abigail, who may well have been the other child in the drawing. God’s “voice” came to me through an artistic vision. More recently, God spoke to me again, this time through music. I have the sincere pleasure of singing in the Southern Oregon Repertory Singers along with Beckie and Laurie Anne, and our spring concert was last Sunday. The concert consisted of all newly composed music. One of the pieces written by local musician Jodi French, “Each Step of the Journey,” had a beautiful prayer/blessing set to music. The words, originally from the Breastplate of St. Patrick, “God be with thee at every pass, Jesus with thee on every hill, Spirit with thee on every stream,” were sung over and over. The last words were repeated 3 times-with thee. By that point, the bass section had dropped out of the piece, and I was able to listen to this beautiful music and the blessing of God’s presence. God spoke to me in that moment as the piece finished- with THEE-with me. It can be difficult to listen for or experience the presence of God. There is so much noise and distraction that can drown out that still small voice. Author James Hamilton shares the following story. “Before refrigerators, people used icehouses to preserve their food. Icehouses had thick walls, no windows, and a tightly fitted door. In winter, when streams and lakes were frozen, large blocks of ice were cut, hauled to the icehouses, and covered with sawdust. Often the ice would last well into the summer. One man lost a valuable watch while working in the icehouse. He searched diligently for it, carefully raking through the sawdust, but didn’t find it. His fellow workers also looked, but their efforts, too, proved futile. A small boy who heard about the fruitless search slipped into the icehouse during the noon hour and soon emerged with the watch. These prayer stations are an opportunity for you to lay down in the sawdust and listen, listen for the still small voice. We began our worship today with the Call to worship. It is a good segue for us as we move to a time to listen for God through these listening stations. Sisters and brothers, as we gather in the welcome of God’s love, as we gather in the joy of our unity in Christ, as we gather in the power of the Spirit, let us listen for the voice of God! Let us worship God, who has spoken and still speaks to those who attend to the roar or the whisper of the Holy One. Amen.